If you love cooking as much as I do, you will agree that having a multi-purpose kitchen appliance is the absolute best thing! One such equipment is the electric griddle. If you love you some grilled meat, or love to hold barbecue parties but don’t have enough room for a barbecue machine, then an electric griddle comes in very handy, thanks to their size and user-friendly mechanics. 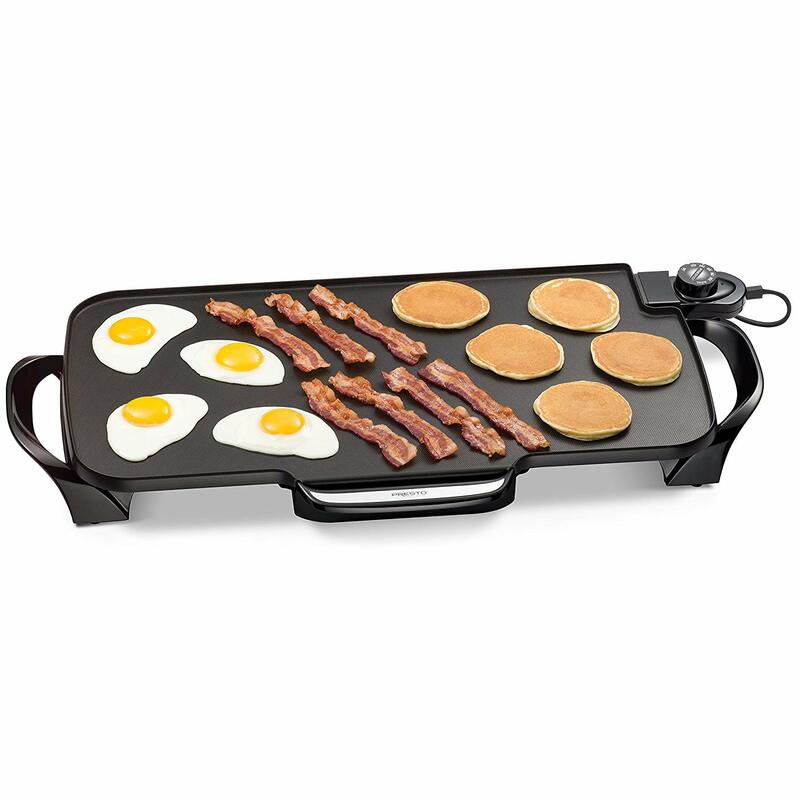 An electric griddle is so amazing because it has a large cooking surface which allows you to make an all in one breakfast buffet, be it bacon, pancakes, toast, all on one surface at a go. It also distributes heat across the entire, ensuring that your food cooks evenly. A griddle is not just good for cooking, but for keeping food warm and even serving. Electric griddles are easier to use in comparison to gas or coal ones. Just plug in and get started. They are safer too. In this post, I will look at 5 electric griddles that are top contenders in the market today, the features that make them unique, their advantages and disadvantages. The Presto 07061 Electric Griddle has a large 22”x11 cooking surface, which allows you to cook for many people all at a go. The cooking surface is made of stiff and long lasting cast aluminum, a great material for a griddle because it is light, strong and great for even heat distribution. This surface also has non-stick coating, meaning you use less oil when cooking, making your meals healthier, and you have a much easier time cleaning. The temperature control on this griddle is very easy to use and the removable heat control allows you to clean the surface easily after the use. This electric griddle uses power of 1500 Watts to cook your mouth watering foods in very little time. It uses Control Master Technology to keep the surface at a consistent temperature, even for heating. It also comes with a drip tray that catches all the fat and any grease spilled over the surface. It has detachable handles making it easy to store in your kitchen cabinet. You would think that with all this great qualities and features, this griddle is bound to cost you a hand and a foot. You would be wrong. The price is really pocket friendly. What is the temperature range for this griddle? Can I use it without attaching the handles? Yes, you can but I wouldn’t advise it. It is dangerous and the thermostat tends to malfunction with the handles off. How best can I clean it? While it’s still warm, take a plastic spatula, scrape off the food, and then use damp paper towels or cloth to wipe it clean. You may want to take off the handles and clean it with warm soapy water every now and them. Just don’t get water on the electric plug. Can I use it as a warming tray? Certainly. Just keep the heat low. How many pancakes can I cook at a time and how long does it take? I managed to cook 8 pancakes at a go in about 4 minutes at 350 degrees. The Presto 07061 22-inch Electric Griddle comes with lots great features making it a great buy. It is easy to use, clean and store, not to mention very affordable. If you are looking to quickly cook various foods for your entire family at a go, then this griddle is perfect for you. The Cuisinart GR-4N 5-in-1 Electric griddle is a practical, multifunctional and well priced kitchen appliance. It is a versatile appliance, a great addition to your kitchen. It allows you to cook a wide variety of foods, making cooking so much easier. With it you can griddle pancakes and eggs for breakfast, make paninis for lunch and grill your steak and chicken for supper. You will require to spray some cooking spray very lightly for foods like eggs, pancakes and anything else that is likely to stick. It comes with one set of two reversible plates which are both non-stick and dishwasher safe. A raised metal grill plate that is perfect for grilling steaks, burgers, chicken, and veggies is on one side of the plate while the other side features a flat griddle plate, ideal for cooking eggs, pancakes, bacon, and French toast. One plate is inserted on the bottom base, while the other plate is inserted on the top cover. Knowing where to insert the plates is easy. Just look for the words “lower” and “upper” embossed into each plate. Just push the plate release buttons to remove them. 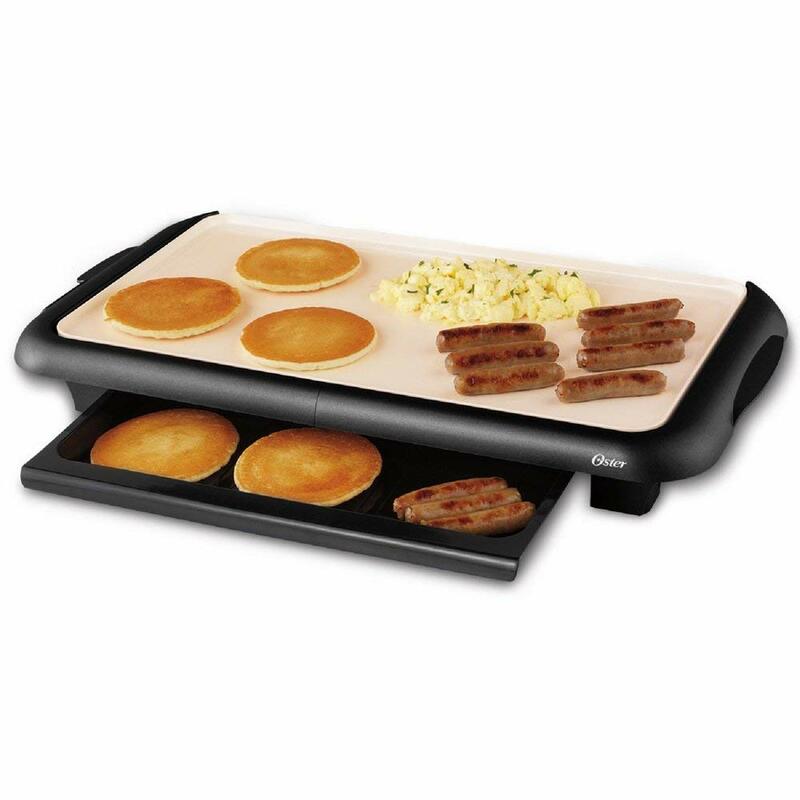 This electric griddle gives you 5 usage options depending on the set up. You can opt for; 1.contact grill, 2.full grill, 3.full griddle, 4.half grill half griddle and 5. Panini press. It is designed to ease your cooking with a lid that opens to give you a larger cooking surface for when you are cooking for many. When opened completely, the Panini-style handle works as a leg. One plate measures 11 x 9 inches, which can cook about 4 small pancakes at a go. If you wish, you can purchase a separate plate for making waffles. What is the highest temperature it can go up to? Can I grill frozen hamburger patty? At what temperature and how long will take? A. Yes, you can. Put it on 325 degrees and then use medium. Close the top to cook. It should be done in about 5 minutes. A. the plates come out making cleaning super easy. Does it come with a waffle plate? A. No. you can order them though. A. It doesn’t have a timer. You must watch your food while it cooks. The GR-4N has revolutionized grilling. It makes unbelievable healthy, delicious meals thanks to its amazing features. It can cook just about anything be it pancakes, waffles, eggs, chicken, you name it. It has quite a large cooking surface 200 square inches), enabling you to cook different things simultaneously. It is quick and super easy to clean. This said, while it may not have the best looking design, it’s no debate that it delivers big! Taking into account its affordability, I have no qualms recommending this griddle. Go on and get it! You will not regret it. The BLACK+DECKER Family-Sized Electric Griddle comes with lots of great features, all that work together to enhance efficiency. You will especially love it if you have a big family, or usually entertain a lot of people because it has a large cooking surface of 12×22 inches. The surface is non-stick and can hold up to servings of food at a go. It also has a drip tray straining the extra grease. With this griddle you can enjoy lots of different foods such as meat, burgers, sandwiches, paninis, pancakes, eggs and crepes. 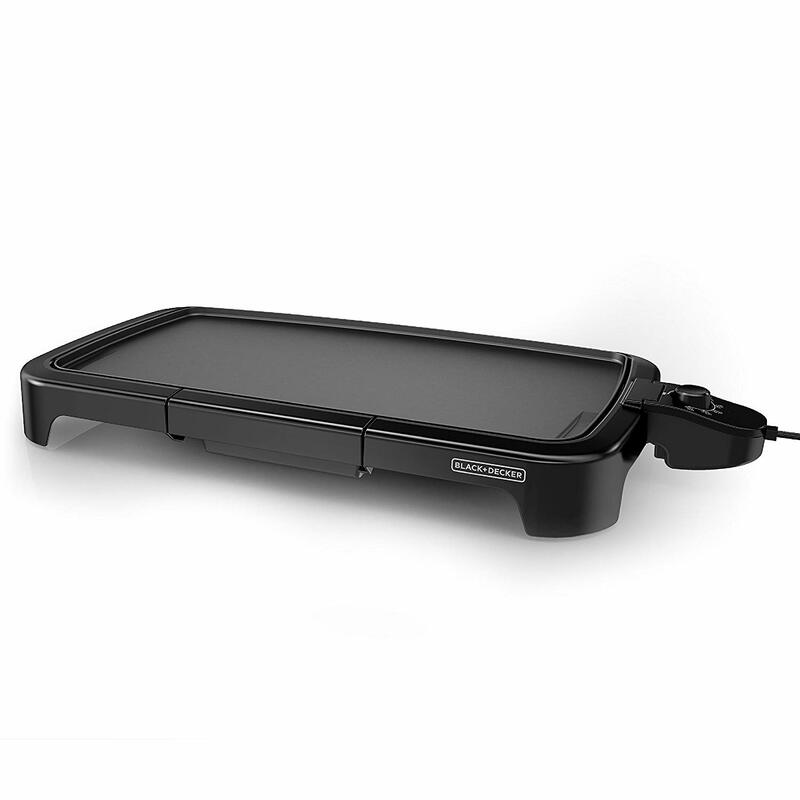 The non-stick surface and the removable drip tray make this griddle easy to clean. It is also dishwasher safe so you don’t ever have to hand wash it. The adjustable dial temperature control, which is also attached to the plug and cord that connects the griddle to the outlet, firmly locks into place on the side of the griddle. The temperature variables are from warm to 400°F. Because the temperature is controlled by a thermostat, the griddle maintains the preferred temperature as you cook. It preheats real quickly and the indicator light lets you know when it is ready to start cooking. The Black+Decker GD2011B is easy to store and is affordably priced. It also features cool-touch sides allowing you to move the griddle without the risk of burning your hands on the hot surface. Does the temperature control stay constant? Or does it turn off once the desired temperature is reached? It’s thermostatically-controlled and stays at the desired temperature. It works very well. What is the wattage on this griddle? Does it shut off automatically if left on after a certain amount of time? Can I use this griddle as a warmer? Yes you can. It has warm setting which is at about 200˚F. The BLACK+DECKER Family-Sized Electric Griddle with Drip Tray, GD2011B is a fabulous choice if you are looking for a budget friendly griddle to make various foods for your entire family. It is easy to use, clean and store. It is also fast and efficient. Go on and give it a try. You will love it! The Oster brings something exciting and fresh to the griddle table. It features a Dura Ceramic surface made from natural materials, which unlike regular Teflon, does not peel or flake. DuraCeramic surface is easy to clean, less likely to scratch and still gives you well-browned food. This griddle is also bound to last you a really long time, thanks to the titanium-infused DuraCeramic non-stick coating which is said to last times more than other non-stick coatings. The DuraCeramic coating on this griddle also helps cook food faster by about 30percent than regular nonstick surfaces. The cooking surface on this griddle is large enough to make food for the entire family. You can make medium-sized pancakes on it. If you require more food than the cooking surface can handle, then you can use the hard warming tray to keep already finished food warm before the rest gets done. This griddle also has an effective built-in grease channel in the cooking surface that sends fat and liquids into the removable drip tray. This minimizes the mess and makes cleanup much easier. The temperature on the Oster Titanium goes up to 420ºF, meaning you can cook various kinds of food on it. The temperature control plug is also adjustable and removable, to ease cleaning. The grill surface heats unevenly. Is the surface of this healthier to cook on than the black coated Teflon variety? Yes, the DuraCeramic non-stick ceramic coating offers healthier food preparation. It is PFOA and PTFE free and offers a durable, long-lasting, easy to clean surface. Can it be submersed in water to clean? The instructions said wash off. I did not submerse mine because clean up is really easy. The trays are removable to wash. Does this griddle need to be seasoned before the first time use? You do not have to season your griddle before you use it. Is the warming tray BPA free plastic? I suspect that it is BPA free. Most plastics are these days. The Oster Titanium Infused Dura Ceramic Griddle with Warming Tray comes with DuraCeramic coating, making fresh and exciting. It cooks fast, cleans easy and is durable, just to mention but a few qualities. Try it, you won’t regret it! The Hamilton Beach 38546 3-in-1 Grill/Griddle is one of the most innovative, efficient, versatile and adaptable griddle in the market today. It is a bit bulkier than other griddles I have come across but comes with features like no other griddle I have reviewed. It is one of the most durably made griddles, thanks to its almost all metal parts. 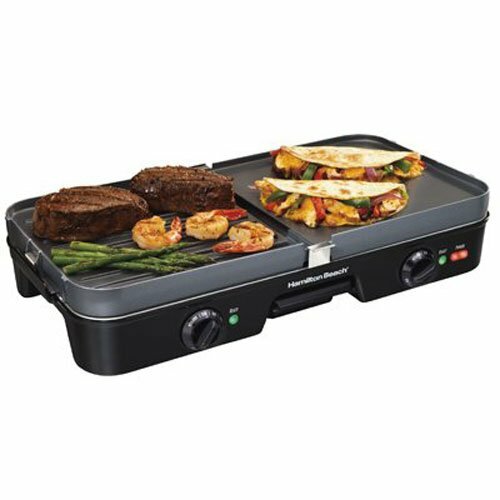 This Hamilton beach electric griddle, like all other Hamilton griddles, is featured as 3-in-1 dual zone griddle/grill with three combinations; griddle/griddle, grill/grill, and grill/griddle. It has removable & reversible grill/griddle grids. 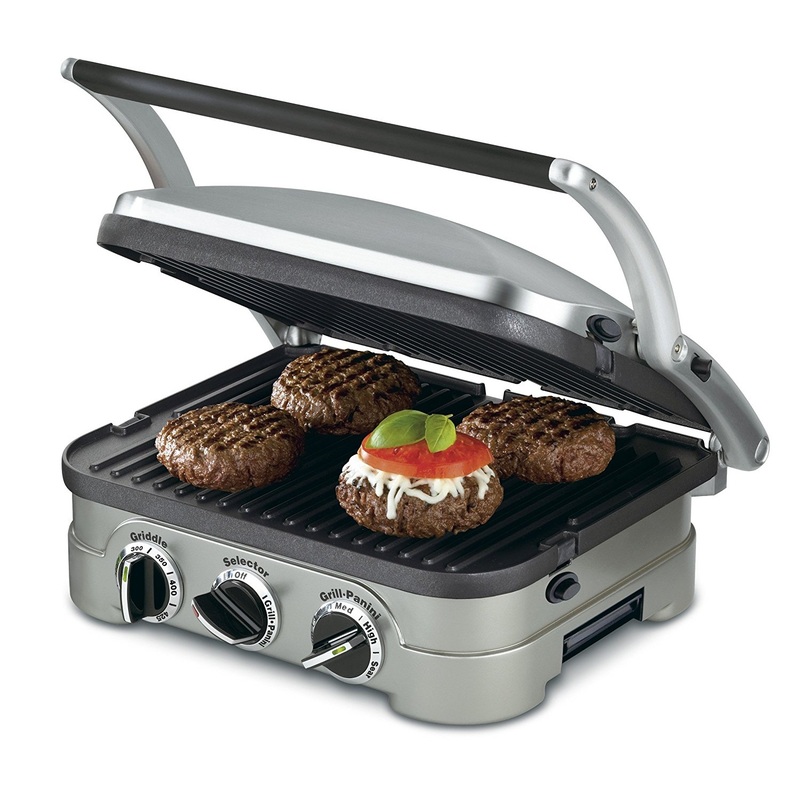 This means that you can use it as an electric grill griddle or an electric griddle grill. Both griddles are washable in a dishwasher with grease control ability or by hand in the sink. This griddle has two separate cooking surfaces. This is fantastic as it prevents mixing of grease from the different grids. Together, the two plates have a sizeable 180 square inches of cooking area. This is large enough to cook a large breakfast for four people or grill hamburgers for eight people. Both cooking surfaces are coated with PTFE & PTAO free non-stick materials. The Hamilton Beach 38546 3-in-1 Grill/Griddle also comes fitted with a center grease tray which collects the excess fat that drips off your meat, is also dishwasher safe. It has a cool-to-the-touch handle to prevent accidents when you are cooking. Best of all, this griddle has two separate heat with independent temperature control. This ensures you cook your different foods at just the appropriate temperature. Can I use it without using any oil at all since it is non-stick? Yes, you can. But you will require spraying some cooking spray on the surface for pancakes, eggs, etc. 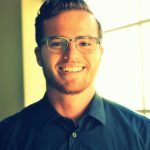 How does it handle stake? It makes mouthwatering stake. You will love it. How high does the temperature go on this griddle? I believe it goes up to 425ºF. How big is this griddle? This grill is 18.25 x9.5 inches. Weight is about 9 pounds. The Hamilton Beach 3-in-1 griddle is a great griddle and grill. It has a large cooking surface to cook for many at a go, has independent temperature allowing you to cook different foods in different temperature at a go, it is easy to use and clean not to mention affordable. If you are looking for a griddle that gives you the above flexibility, then this is ideal for you. There are different types and models of electric griddles on the market today. They come in different prices and have different features. Here are some factors you should take into account before buying one. Cooking surface – whether flat or with ridges, you need to choose a griddle with a non-stick surface. This makes cooking and cleaning easier. Size – if you intend to use it to cook a lot of food for a lot of people, then you should choose a griddle with a large surface area. Heat controls – these will give you total control of the temperature you use when cooking. Some griddles allow you to cook different foods at different temperatures at the same time. Extra Features – different griddles come with different features. For example some come with grill inserts, suitable for you if you’re a fan of grilled food. Safety Features – some griddles come with extra safety features, like heat shield and auto shut-off. These are ideal especially if you have kids. Price – when it comes to griddles, most of the time, the more you spend on a griddle, the better the features you get. Get an affordable griddle that will serve your needs. Warranty – because griddles can be expensive, getting one with warranty is ideal so you can take it back in case it malfunctions. Consider getting a griddle that has extended warranty. It is my sincere hope that this review helps you find the perfect griddle for you. After testing each one of the above griddles, I’ve got to recommend the Presto 07l061 22-inch Electric Griddle. It is a great griddle that comes with lots great features making all that work together to enhance your grilling experience. It is easy to use, clean and store, durable, and very affordable. This is the perfect buy if you are looking to quickly cook various foods for your entire family at a go, without breaking the bank. Try it, you will love it!